How many ODI centuries will Virat Kohli score in his illustrious career? Another game and yet another century! Virat Kohli scored his 2nd century of the series against Australia at Ranchi. Are we surprised? Not really! The batting maestro continues to pile up centuries game after game at a pace that appears not just astonishing but actually unreal. Over the years, the game of cricket has witnessed a number of legends – Sir Don Bradman, Sir Vivian Richards, Sunil Gavaskar, Brian Lara, Ricky Pointing, Sachin Tendulkar but one thing that really sets this player apart is the level of consistency and he is only getting better with every passing day! On 18th March 2012, Sachin Tendulkar played his last ODI ending with 49 centuries in a career that spanned over two decades (almost 25 years) and 463 ODIs (largest by anyone till date). That day, not many could have imagined anyone even coming closer to his batting records especially in regards to runs (18,426) and centuries. 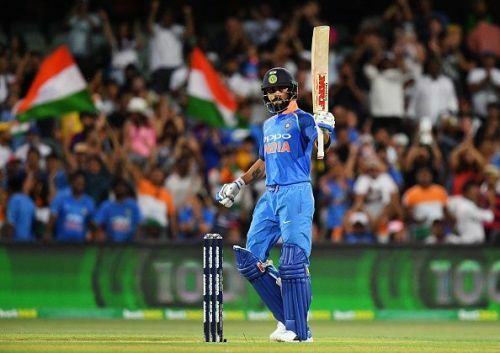 And while the entire nation was moaning over Sachin’s retirement from ODIs, on the side of the 22 yards, in the very same game, was another batsman that scored his 11th ODI century – Interestingly none other than Virat Kohli (183). Almost exactly 7 years later, Kohli with 41 ODI centuries against his name is on the verge of breaking the record that was once considered beyond anyone’s reach. Without a doubt, the 30-year-old run-machine will score his 50th ODI century and achieve one of the biggest cricketing milestones very soon.